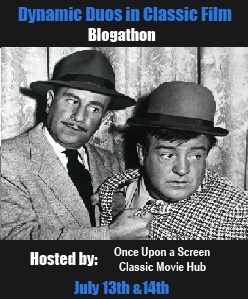 Between this blog and my previous one, Professor Damian’s Public Domain Treasure Chest, I’ve been writing about movies for quite a while now. Because of that, there are a lot of posts that have simply gotten lost to the mists of time. So, I figured I’d use the idea of “Throwback Thursday” to spotlight some of those older posts, re-presenting them pretty much exactly as they first appeared except for updating links where necessary or possible, and doing just a bit of re-formatting to help them fit better into the style of this blog. Hope you enjoy these looks back. One quick note about today’s post: In the original, I credited the playlist to a certain YouTube user, but that has since been taken down. Fortunately, since the episodes are still readily available, I was able to recreate the playlist, and that is what I have embedded below. Supposedly that’s the reason given by then ABC Entertainment president Tony Thomopoulos in 1982 for the cancellation of the TV show Police Squad! 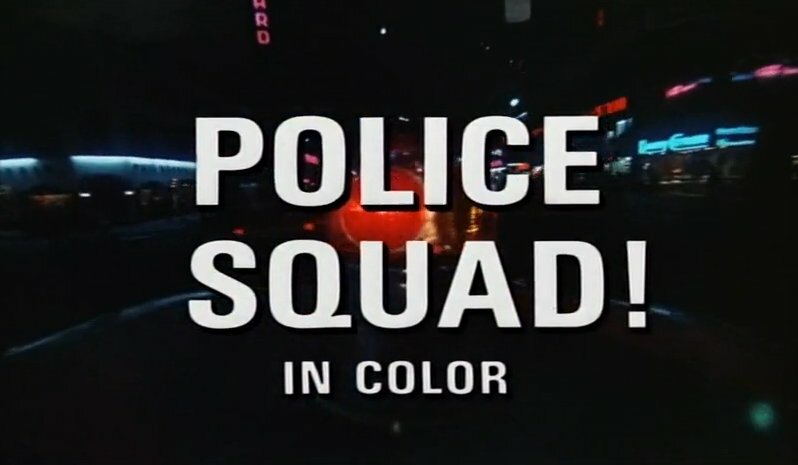 (yes, the exclamation point is part of the show’s official name) after the network aired only six episodes of the show. 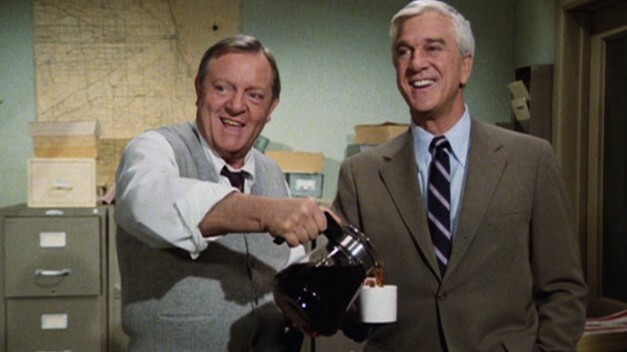 Created by David Zucker, Jim Abrahams and Jerry Zucker, the team behind the movie Airplane!, and starring Leslie Nielsen who had found a new rather surprising second life as a comedy star in that movie, the television show was a loving tribute to and parody of the great cop shows of the past. I recently took the time to rewatch all six episodes with my soon-to-be-14-year-old daughter, (well, it was a re-watch for me, and of course a first time viewing for her), and though Thomopoulos’s statement may seem a little ridiculous at first, there is quite a bit of truth behind what he says. 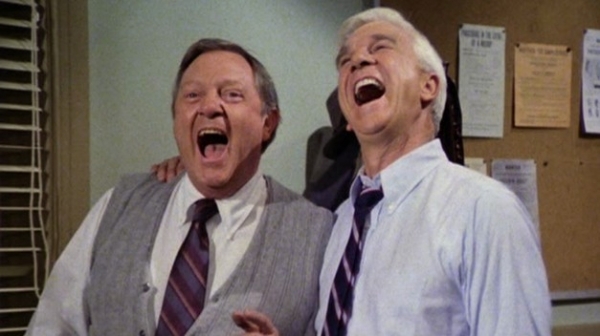 Like its predecessor movie (and let me take just a moment right here to say that if you haven’t ever seen Airplane! you really should), it is not a show that rewards multi-tasking. So many of the jokes are sight gags or visual puns, that if you’re not giving the show your full attention, then you’re going to simply miss a lot of them. Of course, some might say that that might be even more of a problem now, when so many people “watch” television while texting or spending time on the internet or doing so many other things, that to get people to pay attention enough to what is happening literally every second the show is on may seem impossible. However, there is also a flip side to that. Because of today’s technology, when it’s so much easier to pause or go back to catch some of the small “what did he say?” or “did I really see that?” moments, viewers who are willing to invest the time and attention into these episodes will find themselves amply rewarded in ways that viewers who originally watched these episodes on television may simply not have been able to. One other caveat I feel I should include about this show. It is definitely a product of its time, and there are a number of jokes that simply won’t make sense to younger viewers because they make reference to cultural phenomenon or include guest stars in cameos that those born after a certain period of time simply won’t be familiar with. But then, that’s another of the advantages to having things like Google and Wikipedia available. So that when Dr. Joyce Brothers shows up, there’s at least a chance for today’s viewers to figure out why it’s funny. Hmmm… perhaps Tony Thomopoulos was right after all. Hiya, kiddies! So, the “old dark house”. It’s a mystery/horror sub-genre that we’ve discussed before, and honestly, it’s one of my favorites. I suppose one of the main reasons is because it’s like ordering a favorite meal at a restaurant. Even if you’ve never been to that particular eatery before, you still pretty well know what the ingredients are going to be and how it’s going to taste before you get it. Oh, sure, one cook may include a bit more or less of this ingredient or may put them together in a way that tries to impart a bit of his or her own personal style, but nine times out of ten you’re going to get something pretty much the same as that dish that you’ve enjoyed time and again. 2) There is some reason for everyone to be suspicious of everyone else – often the cause of the gathering is the reading of a will which leaves one or more parties dissatisfied with the results. In this particular case the Mcguffin is the anniversary of the murder of the husband of one of the characters. 3) There should be at least one “coincidental” connection between some of the characters – ofttimes one or more will know another character from a different setting. 4) Quite often there is also a random element thrown into the mix – for instance here we are informed of an inmate recently escaped from an insane asylum. 5) Eventually all of the lights in the house will inexplicably go out, and when they come back on, someone will have been killed leaving the survivors to try to figure out who among them could possibly be the killer. 6) Soon, even more mysterious things begin to happen – a strange hand will reach out from around a corner, the eyes of a picture will move in a way that tells us someone unknown is watching the proceedings, more people will die or disappear, secret passages will be found and more. Yep, kiddies, all of these elements are present in The Ghost Walks, just as they are in pretty much all old dark house mysteries. What sets this particular film apart from most of its brethren of the genre, however, is the twist that occurs just after the victim of the first murder is revealed. Now, I’m not going to say that it turns this little quickie into a great movie, but it does serve not only to explain some of the “coincidences” that we’re asked to swallow during the first act, and also provides the film with a sense of humor that it would otherwise be lacking, which helps to keep the whole piece from becoming too familiar and dreary. In other words, just as with that one time in ten that that favorite meal is transformed into something above and beyond just “the usual”, The Ghost Walks manages also to take the usual ingredients and transform them into a unique taste sensation. Politics, conspiracies, political conspiracy thrillers – they never go out of style. Here’s a revisit of a good one from the 70s. I’m not sure exactly why I decided last night’s movie would be 1974’s The Parallax View, or even when I put it in my Netflix queue. Still, there it was, and since I was in a kind of “what the heck” mood, I decided to give it a go. Coming out at a time when political corruption, conspiracy theories, and political assassinations were all at the forefront of the American psyche, The Parallax View is according to Wikipedia, the middle film in director Alan J. Pakula‘s so-called “Political Paranoia Trilogy” which also includes 1971’s Klute, which I haven’t yet seen, and 1976’s All The President’s Men, which I have. (Though it has been awhile, and I probably should revisit it sometime soon.) This is not to say that the film relies on any knowledge of, or even directly relates to either of those films, as the link between them is one of theme more than plot. The Parallax view stars Warren Beatty as Joseph Frady, a somewhat naive reporter who finds himself drawn unwillingly into a world of political intrigue and, yes. conspiratorial assassination. The guiding force behind these assassinations turns out to be the titular Parallax Corporation which actively recruits people like Frady, people who seem to be on the edge, to become assassins. The movie is very much one of its time, making use of then-popular pop-culture tropes such as personality testing and visual brain washing. There is even a scene which echoes the forced retraining scene in Stanley Kubrick’s A Clockwork Orange, with a very interesting video montage, though the scene itself is much less disturbing and intense than that of the Kubrick film. And perhaps that’s the problem with the entire film, and why it was less well received and remains much less well remembered than Pakula’s two other films in this “trilogy”. It simply never manages to convey any real sense of intensity or immediacy. Under Pakula’s direction, scenes such as the opening fight on the top of Seattle’s Space Needle, which could have provided great tension seem much too removed and foreshortened to truly give it any sense of what is at stake, and that is something that carries through the length of the movie, making it seem rather disjointed and – while it’s not particularly hard to follow – jumpy, as Frady moves from point to point in following the conspiracy depending far too much on what seems coincidence. Of course, it could be argued that these coincidences are not what they seem, but that is not a point that the movie really addresses, so the viewer is left at times having to play catch up just a bit too much. As far as the acting goes, Beatty, whose talent onscreen was unfortunately for most of his career overshadowed by his offscreen reputation turns in his usual engaging performance. 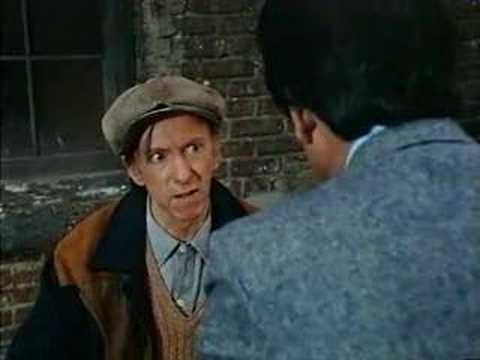 He is very ably backed by a supporting cast which includes Hume Cronyn, William Daniels and Paula Prentiss, all of whom are good here, but never seem as engaged as they would be in other roles. In the end, The Parallax View is a pretty typical 70s conspiracy thriller, complete with a relatively nihilistic ending which was the going trend at the time. It is certainly worth the time if you have nothing better to do with an evening and are a fan of this kind of film, but at the same time, I can’t consider putting it in the category of a “must see”. Thought we’d take another look back at a silent film from the Professor Damian days. Way back in the day, when yours truly was but a young perfessor, one of my favorite movies was the 1954 Disney-produced version of Jules Verne’s classic tale 20,000 Leagues Under the Sea. Sure, from today’s historical and literary perspective it was horribly miscast, and much of the subtleties of Verne’s original characterizations is missing, but for a young lad there was nothing that could spark the imagination like the undersea adventures of the Nautilus and her crew. James Mason cast an imposing regality as the imperious Captain Nemo, and when Kirk Douglas risked his life battling that giant octopus, well, to my young mind there was no match for his cleft-chinned heroics. 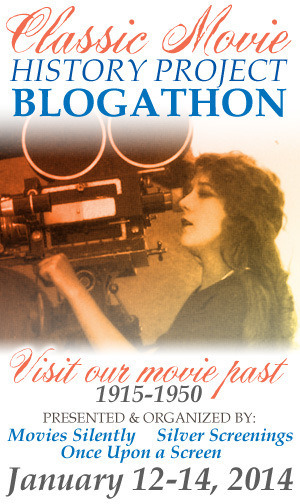 Imagine my delight, then, in discovering while researching the silent films to include in this mini-festival that there was a much earlier silent version of the tale that I could include here. Of course, almost as soon as I saw the opportunity, the questions also began to arise. Was there any way that such an early version could pull off the effects necessary to tell the story? At this point, filmmakers were only just exploring land based photography, how would they possibly pull off the underwater effects? And was there any way that it could bring the excitement and joy that the Disney version had to my young boy’s heart? And would it, being an adaptation much closer in time to the source material also be closer in details? Well, I fear the answer is both “yes” and “no”. As far as the effects and underwater photography goes, there can truly be very few complaints. Both the poster seen above and the opening title cards credit the “Williamson Brothers” and their fantastic “inventions” for the actually quite incredible for the time underwater photography. According to Wikipedia, the secret of these “inventions” was not actual underwater cameras, but a series of tubes and mirrors that “allowed the camera to shoot reflected images of underwater scenes staged in shallow sunlit waters”. This technique allowed the filmmakers to capture some truly incredible shots of undersea life and of Nemo’s crew under water in what are actually fairly credible designs for early scuba suits, even though actual SCUBA gear wasn’t developed until 1939. Unfortunately, once one gets beyond some of the amazing-for-it’s-time photography, one also has to look at the plot, and unfortunately, that is where the film really falls down. First of all, despite the title and an opening 10 minutes or so that are quite faithful to the original tale, the film for some reason soon twists and begins to incorporate ideas and plot-lines from Verne’s other Nemo novel, Mysterious Island. Instead of simply exploring the undersea world and the adventures of the Nautilus which would definitely give enough fodder for a film of this length, the viewer is also taken to an island not far away from the submarine’s current location where a balloon full of Union soldiers crashes, soon followed by the arrival of a yacht owned by a man named Charles Denver who turns out to be not only known to Nemo, but the man upon whom our glorious captain has been seeking revenge all these years. Actually, it’s with Captain Nemo and this desire for revenge that the film really makes its most egregious errors. As soon as an intertitle card pops up saying “Captain Nemo reveals the tragic secret of his life, which Jules Verne never told.”, it’s obvious that not only is the movie going to merge the two Verne novels, it’s going to go beyond them in an attempt to create a backstory that is completely unnecessary and leads the film even further into directions it doesn’t need to go. One thing I must, however, give the filmmakers credit for is retaining Nemo’s national identity as an Eastern Indian. So, in the end, this version of 20,000 Leagues, I must admit, will not replace the Mason/Douglas version in my heart, though it definitely should be seen if only for the admittedly quite good early effects and as an opportunity to see how early filmmakers overcame the technological obstacles of their day to create something new in this developing storytelling technique called “the movies”. Hope you enjoyed this blast from the past. 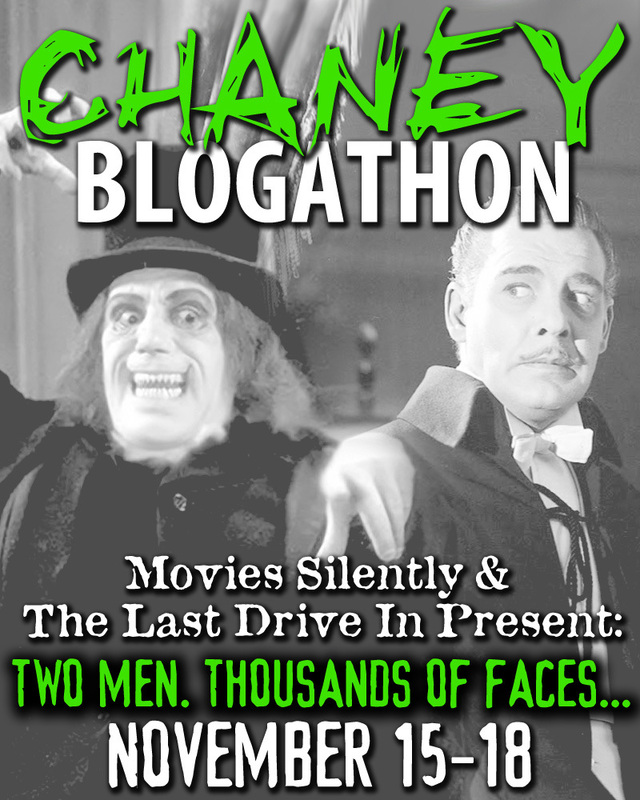 And for a special bonus, be sure to check out this week’s Silent Sunday which will feature the full movie. 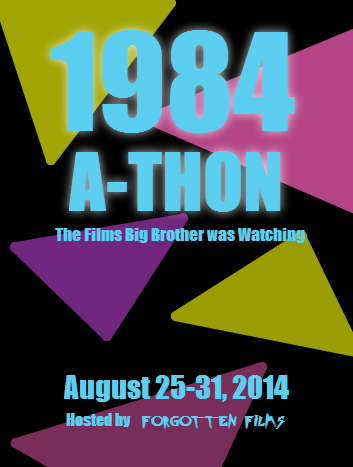 Oh, and be sure to check out this week’s Silent Sunday when I’ll present the full restored version of this movie. Poor Professor Challenger – though he may very well be as intelligent, his temper, I fear, made him always destined be live in the shadow of his literary step-brother Shelock Holmes. Unfortunately for the professor, this secondary creation of Sir Arthur Conan Doyle never was able to burst into the limelight or gain the popularity of the famed detective. Even in today’s feature, the second in our look at silent films, he is truly upstaged by a pack of dinosaurs. Actually, the Lost World is notable in a number of ways. It was made with the full cooperation of Conan Doyle, who actually appears in the introduction of the film. It was the first feature length film to employ stop-motion animation as its main source of special effects. It contains on of the first examples of what we call today “product placement” (look for the Corona typewriters being used). And it was the first film shown to passengers on an airplane. (It was shown on a London to Paris Imperial Airlines flight in April 1925). But more than all of that, it’s simply a ripping good adventure yarn. Young reporter Edward Malone is drawn to a speech being given by Professor Challenger who claims that his friend, disappeared explorer Maple White, has discovered a plateau in South America where beasts from another time still live. Ridiculed for his claims, Challenger gathers a group to return to the plateau, see if they can rescue White, and also prove his fanciful claims. The group includes Challenger and Malone, hunter John Roxton, White’s daughter Paula, and an Indian manservant and Challenger’s butler. Yeah, seriously, his butler. After days of exploring and traveling the Amazon, the party finally find themselves at the base of the plateau. The only problem is that it is only approachable by climbing one side of a mountain and then walking across a log crossing a deep chasm to the actual plain. They consider turning back, as they have seen no evidence that the mythical beasts for which they are searching are even up there. No evidence, that is, until a pterodactyl comes flying onto the screen and lands upon the prominence they are considering climbing. This sighting is quickly followed by the appearance of a brontosaur and then a number of other prehistoric creatures, all of whom seem to delight in fighting and killing each other. To make matters worse, once the group has made it to the plateua, one of the ornery critters tosses their log bridge down into the crevasse, seemingly trapping them there forever. How about a trailer spotlighting some of the great effects scenes? The reason for the comment, of course, is because the “official” Avengers line-up at the end of the movie is very different than the one we have at the beginning of it. In the last few scenes we see the departure of Iron Man, Thor, Hawkeye, and the Hulk, and as their replacements we have a new team led by Captain America and the Black Widow, along with new recruits War Machine, The Falcon, The Vision, and The Scarlet Witch. This immediately made me think of the original run of the Avengers comic, way back in antediluvian times when Stan Lee was still writing the book (along with almost every other book that Marvel was putting out at the time), and especially Avengers Vol 1 #16. 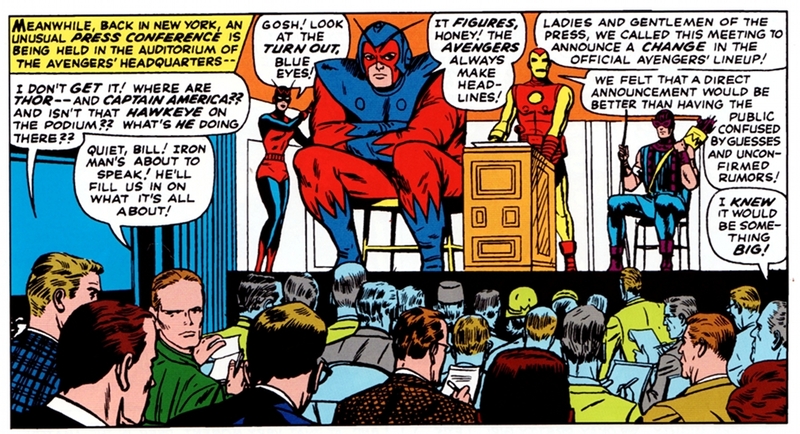 That particular issue, entitled “The Old Order Changeth”, is the first time in the comics that we actually see a full scale change in the make-up of the Avengers team, and at the end there is even a press conference where the new line up is announced. That’s right, gang. 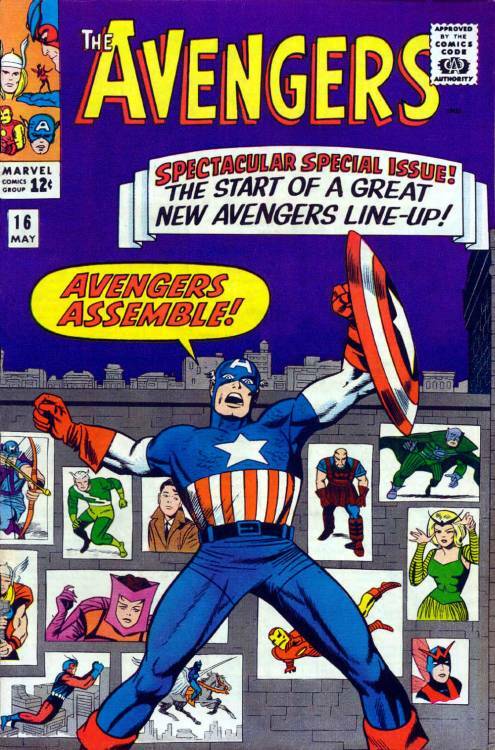 Despite what you may have been led to believe subsequently, Cap wasn’t even one of the original founding member of the comic book version of the Avengers. 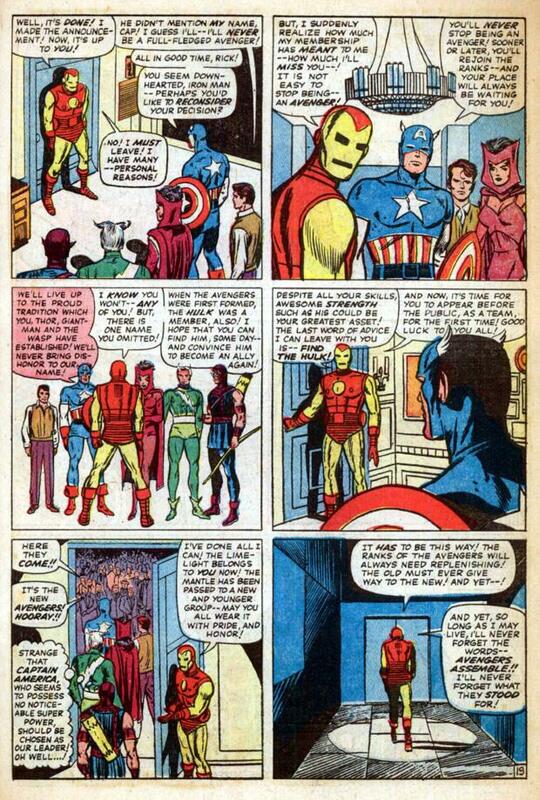 Instead, we had Iron Man, Thor, Ant-Man (who quickly became Giant-Man – don’t ask), The Hulk, and The Wasp. The problem with this line-up, quickly became apparent to Stan. Because each of these characters also had their own solo titles, and he felt that any real changes made to those characters should be made there rather than in a team book that not all of the character’s readers might be following, he felt ham-strung by the very nature of the team. So what was the solution? Promote some lesser characters who didn’t have their own books to the majors by making them Avengers and at the same time, give him some heroes that he could do more with. Of course, Stan being Stan, who at the time was in a mode where he really was trying to challenge himself and his fellow creators, (and also because even if he took some of the lesser heroes and included them in the roster, most of them also had their individual titles, so he would still be stuck in the same boat) he didn’t exactly take the easy way out. Of course, this left not only Cap but the public wondering just how this motley crew, subsequently nicknamed “Cap’s Kooky Quartet” could possibly live up to the legacy of the teams founders. Fortunately, Captain America, having trained and led troops into battle in the 40s didn’t have too work too long to teach these disparate characters how to be a well-oiled machine. 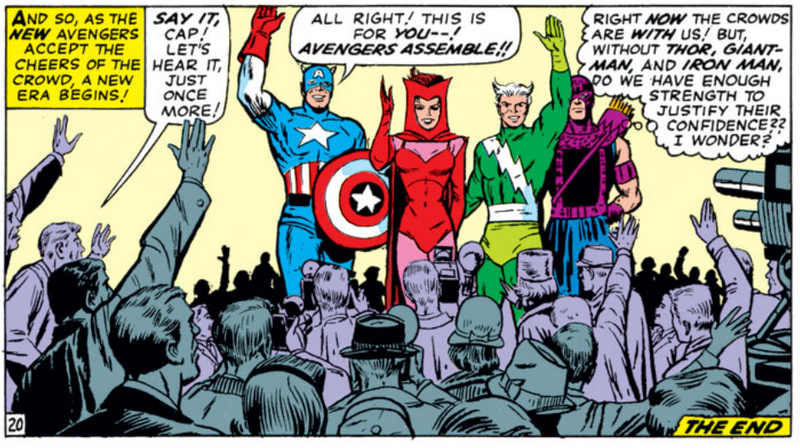 Eventually, of course, the original Avengers began to return – the first one back full time being Giant-Man, at that point going by the name Goliath, and new cast members were continually added, and eventually even the title “The Old Order Changeth” or some variation thereon became something of a tradition whenever a new formal grouping of Avengers was being announced. 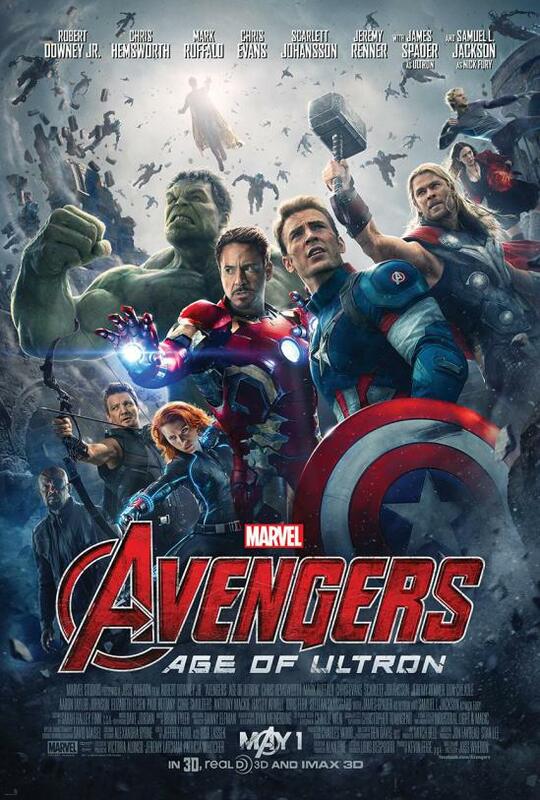 So the change in line-up at the end of Age of Ultron is really just a part of the Avengers tradition going back to the very first. And by the time we get to the next Avengers movie, having made it through Captain America:Civil War, Thor:Ragnarock, and whatever solo movies might impact the makeup of the team (for instance, the upcoming Black Panther movie, though the character is supposed to be introduced in Civil War) who knows who may or may not be Avengers. Between this blog and my previous one, Professor Damian’s Public Domain Treasure Chest, I’ve been writing about movies for quite a while now. Because of that, there are a lot of posts that have simply gotten lost to the misAll Poststs of time. So, I figured I’d use the idea of “Throwback Thursday” to spotlight some of those older posts, re-presenting them pretty much exactly as they first appeared except for updating links where necessary or possible, and doing just a bit of re-formatting to help them fit better into the style of this blog. Hope you enjoy these looks back. In celebration of the release of Avengers: Infinity War this past weekend, I thought it might be interesting to look back at this short piece from the Professor Damian days. Ok, to make up for the long time between posts (and the fact that the “Sunday Serial” isn’t actually hitting until Monday morning), here’s a little bonus for you. Youtuber whoiseyevan has made a series of trailers for what he calls “premakes”. The basic concept is sort of what if certain movies like Raiders of the Lost Ark or The Empire Strikes Back were made in a different era? 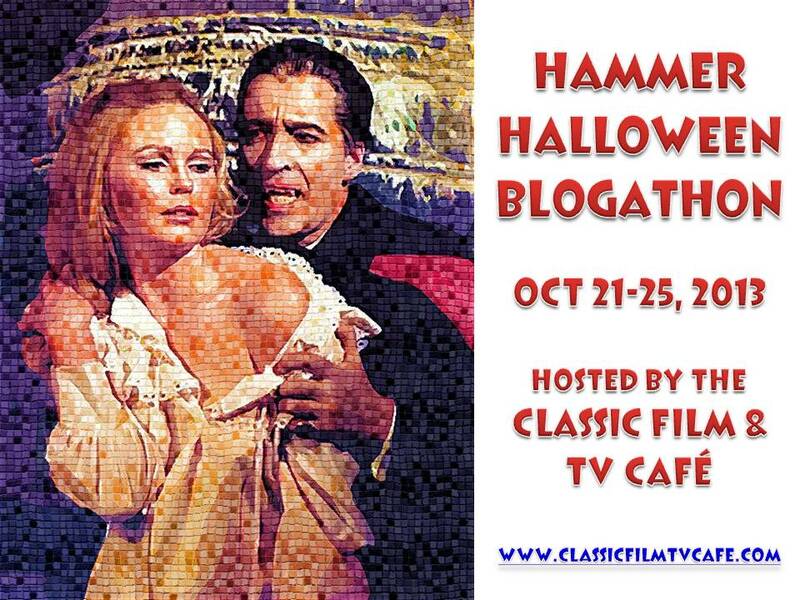 Then through the strategic editing of classic clips and new narration he has made trailers for these unfortunately never-to-be-seen classics. Yeah, now that’s a flick I’d love to see.Let’s just hope next year’s big-budget version shows half the imagination and excitement of this short. And be sure to check out whoiseyevan’s other premakes on his youtube page.